Two stage. 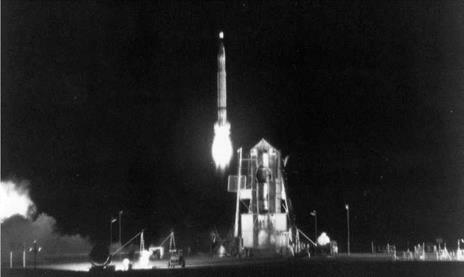 Launched 6 November 1964 at 23:15. Apogee 391 miles. The launch was successful with the first stage performance exceeding expectations. Problems arose with the Imp motors and the sabot: the head was fired at an angle meaning that re-entry did not occur where predicted. The lanyard broke before the sabot had been significantly retarded, which meant it followed close behind the head. In addition, the clutch on the tape recorder inside the head began to stick and the tape ran erratically. No useful data was obtained from it. Figure 101. The picture shows the launch of BK20: since all but one of the firings took place on dark moonless nights, such pictures are rare.